There can not be a better donation than blood donation. Actioning this thought, a blood donation camp was organized in the campus in association with Blood Bank & Govt. Medical College, Patiala. Collection of over 100 units of blood at the camp spaeks volumes about the enthusiasm of the participating students and teachers towards this social cause. 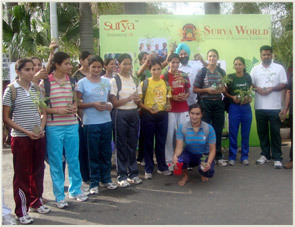 It was time to 'give back to nature' as we observed the Save Earth Day at the Sukhna lake. Through an interesting infotainment session, the student volunteers oriented the general public about environment conversation. Later on, people were offered saplings of decorative as well as ornamental plants by our Guest of Honour on the occasion– Dr. R S Khandpur– Director General of Pushpa Gujral Science City, Kapurthala. It was nice to note as we could distribute over 3000 saplings through this plantation drive . 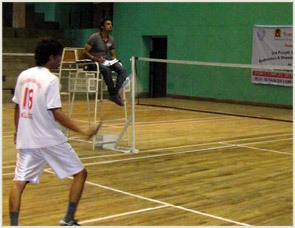 Hand hold us and give us an enabling environment and we will show you that we are not disabled but only differently abled; this was so vividly demonstrated at the 3rd Deaf & Dumb Badminton & Wrestling Championship jointly organised by the Surya World & Punjab Deaf & Dumb Sports Association at Sports Complex, Sector 42 Chandigarh. More than 200 differently abled participants from all over Punjab presented a spectacular show of indomitable spirit and resilience. 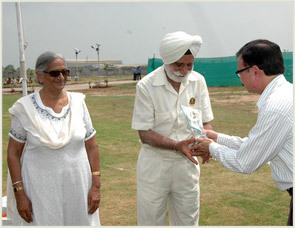 At the valedictory session, the winners in all the categories were awarded. Taking forward this mandate of hand holding the differently abled, Surya World also supported another sporting event and it was National Sports Meet organised by the Indian Blind Sports Association at the Institute for The Blind, Sector 26, Chandigarh. Almost all the eyes were moist as we saw these children feeling the athletic kits given to them by then by Surya World, trying these new sporting gears and expressing their joy by touching themselves or each other. In any natural calamity, it is always the rehabilitation which is more critical than the immediate relief. 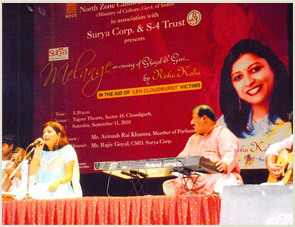 Responding to this urgency, Surya World presented an innovative and engaging cultural extravaganza, Surya Melange. All the proceeds of this concert were donated towards the rehabilitation of Leh victims. Mr Avinash Rai Khanna, Member Parliament and the Chief Guest on the occasion felicitated our CMD, Mr Rajiv Goyal for this noble gesture in the hour of national strife and calamity. They say speaking against any injustice is the first and foremost step against stopping that injustice. Against this backdrop, Surya world marked the observance of Human Rights Day by organising a very engaging and interesting debate themed, “Speak Up, Stop Discrimination” at the campus. Not only the participation in the debate by the students was very encouraging but also the issues raised by them especially the importance of rights of the youth, poor and downtrodden sections of society were quite thought proving, making the entire event quite an enriching and learning experience. We owe this independence to those heroes of the nation who made the supreme sacrifice by laying down their lives so that we live in peace. This was the spirit at the Independence Day Celebrations at the campus this year. It was a very proud as well as emotional moment when families of some of martyrs of the nations were honoured on the occasion. A web page dedicated to their memory was also launched by Mr Sudhir Dayal, DGM, State Bank of India and Chief Guest on the event. Health is the least priority for those who find it difficult to meet both ends and dental health does not even figure anywhere. 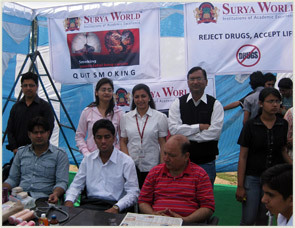 Responding to this need, Surya World conducts regular free health camps in its vicinity for the benefit of people living in nearby areas. At a recently organised Dental Health Camp, more than 135 patients were examined and treated at an ultra modern dental care clinic manned by a trained dentist and other staff. Envisioning education as the biggest leveller, Surya World contributed towards the education of street children by donating the school books, stationary and woollen clothing to them. As a thanks giving gesture, these slum dwelling children presented an admirable cultural show which the visiting team from Surya World thoroughly enjoyed. Mr Zulfikar Khan, President Theatre Age, supporting these children was much thankful of this gesture and the commitment of future help by Surya World to enable these children continue their studies. 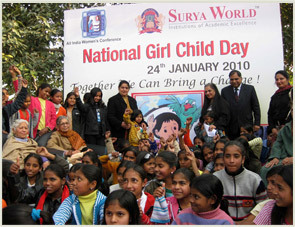 Committing their support to UNICEF’s MEENA, an initiative to save the girl child, Surya World observed National Girl Child Day on 24 January, 2011 at Sector 17 Plaza, Chandigarh by organising a painting competition and a rally among the slum dwelling girl children of the nearby Kajheri village. In a tie-up with Society for Social Health (NGO) working for the needs of the slum girl children, Surya World oriented the participants about the rights of the Girl child. Mrs Lalit Joshi, Chairperson of the Chandigarh State Social Welfare Board and Chief Guest on the occasion gave away cash prizes to the winning entries of the painting competition. The cultural show presented by the girl children was appreciated by all.